Relationship marketing refers to the form of marketing that developed from direct response marketing campaigns which emphasizes customer retention and satisfaction rather than a dominant focus on sales transaction. In common language, relationship marketing is taking care of your customers and all humans in general to build a bond in which both seller and customer have a bonding beyond business. It’s not like traditional marketing where your terms end after a particular sales goal is over; here you build a lifelong relationship for more business opportunities. Through relationship marketing a blogger or business aims at making a relationship or comfort zone with a client that doesn’t aim at a one off sales. The aim is to make lifetime business relationships. In relationship marketing you consider “sales” as your starting point for business opportunities and aim at getting more in the long run. Relationship marketing aims at delivering and talking value they provide to the customers even beyond their sales opportunities. In a layman’s words, here you take your customers as the main aim. It may be like taking your customer as your friend and talking to him, listening him and even solving his problems no matter its beyond your product scope. For example, when Mari Smith was tolerating a flight delay, the Alaska air manager at San Diego bought her an IPhone charger. Now this is what is called relationship marketing. The manager was not entitled to buy her anything but he did as a friend would do in such a situation. Result, the flight delay was not as painful as it could be and they won Mari as a good client or customer. Relationship marketing starts even before presales and continues to post sales through sales. Click To Tweet. Relationship marketing not only is an approach by online small and large businesses but also has an approach in the offline business models. The fact that value to the customers can be given at any realm shows that relationship marketing aims at both the offline and online marketing skills. You got to be good at social media marketing and you got to do brand management well. Again relationship marketing to offline businesses refers to use of various TV ads, newspaper advertisement slots, billboards and even salesmanship. Here are certain tactics for doing relationship marketing effectively. In order to serve the customer you need to know who they are. Only after the initial knowing you can think of aiming to serve the person better. For this you need to go on social media. Social media marketing is an essential step in knowing who your audience is. You could know the basics about who your audience is by analyzing your product. If your product is something related to women find your business prospects on Pinterest or even Facebook. You could also use Google alerts to monitor when people are talking to you; the ones talking about your products are nobody else but your customers or potential customers. Here is a huge list of tools to help you monitor your prospects on social media. Companies like Zappos, Ford and Starbucks are the real stars of relationship marketing. They forget their egos and get inside the talks going on between their customers (no I am not talking of interrupting). Zappos and Starbucks are always active on social media and do a good campaign to show their stand and voice. In order to manage your relationship marketing campaign you need to tell your customers or readers that they are valued. Gift them an incentive just like Starbucks does by giving free servings and other goodies to loyal customers. You could also send a free kit of your upcoming product, course or a trailer of your video to your customer asking their views on it. Won’t they be amazed by knowing their opinions matter? If you are a blogger you can practice relationship marketing by emailing a PDF of your post to your subscribers etc. any sort of good reward is considered a good technique to practice relationship marketing by most consumer oriented businesses. Social listening is one of the most important tools of relationship marketing. You need to be aware of what your consumers are saying to you by studying their behavior. If it’s a positive feedback you should use it as a token to get inspired to work likely. If your customers are speaking negative about your product, you should act ASAP to deal with it. You could talk to them, provide one on one tutorials, free demo services and do whatever you want in order to get your customers happy and back to track. 5) Does your business have a blog? A must have tool for relationship marketing. Having a blog or a website for your company is highly essential in your relationship marketing campaigns. Buffer for example, has used its blog to provide in-depth research oriented guides and blog posts that help its customers (social media enthusiasts and online marketers) do better social media marketing. Through this blog, they subtly advertise and instill the buffer value in the sub-conscious minds of the readers which are easily converted from suspects to prospects and then paying leads in the time course. A well-established blog is the best tool for relationship marketing and it could help you in gaining new search engine visitors. Here is the most detailed guide to getting started with your own business blog. CRM or customer relationship management is a very integral part of relationship marketing. It is so related to the latter that they are sometimes one and the same concept. CRM is defined as a business process in which client relationships, customer loyalties and brand value are built through marketing strategies. While RM deals with strategies formulation CRM sees how these strategies are implemented in the next level. CRM can be also thought as an interdependent or marrying concept where both the business and its customers are both in the advantageous zone. The client gets rewarded for being a valued customer and on the other hand the company gets a loyal customer in return for some additional freebies and value. CRM also indirectly helps in cross selling where the word of mouth plays a major role. In this process the customer satisfied by the values your business gives speaks good about your product to every potential client he meets. Here the client does not get benefited; instead the business gets the reward for providing value as the positive publicity will help it to reach to more leads beyond his organic reach. When you have built a strong relationship with your audience or clients they tend to go loyal. Most of the time, your value to the customers make them buy an upcoming product and they may help you in increasing sales. It is exactly opposite with traditional marketing where you don’t attempt to influence the customer (or try at least) to make a second purchase. When you have more sales and your returning customers are your loyal customers they pay you the price you deserve and thus your profit boosts. Did you notice I mentioned word of mouth in the previous section? Yes it is this customer satisfaction that tempts them to spread a positive word of mouth which further helps businesses to gain more leads. Nearly 84% of the purchasers take advice from their near and known ones before making a purchase. Organizations can actually reach far beyond their primary reach with word of mouth. While focusing on giving value to your existing customers, you might spent far more than your budget for that financial year which might lead to loses. Business means endless opportunities to make new customers, but while indulging in RM many of us might forget that we could use that time to get connected to new as well as complete random set of leads that would otherwise never come in contact with the product. While this is very rare you cannot ignore the chances of getting victimized of a negative campaign. When something goes wrong the fickle-minded crowd might spread negative word of mouth and this can ruin your business campaign as a whole. Relationship marketing was always existent. In India we consider customers as Gods or god-like and respect them a lot. That is the essence of relationship marketing. You have to build a relationship beyond your business goals much like something on a family basis. This works at all levels. Even bloggers can use relationship marketing as a tool to get more engagement in social media and blogging. This engagement can then be converted into loyal readership, which can then be taken into lead generation step. 2) The definitive guide to relationship marketing strategies. This is really very important and helpful to make relationship with marketing and we have to give importance to our clients and other workers.Thank you for this amazing information. Swadhin, this post is definitely gonna help those who don’t give importance to relationship marketing. We definitely need to stay in touch with our clients and other bloggers to gain trust and other benefits. Some bloggers are working for same clients from a long time, and that’s all because of the reason that clients are satisfied with their service. Relationship marketing will become more important day by day. Best bloggers get many comments on every blog post which is mainly because they know the proper way of communicating and marketing. Very good post. I can attest to the effectiveness of relationship marketing. Some of my clients have been with me for more than 2 years because of this strategy. Great bits of advice here, relationship marketing is becoming so much more important these days and that applies to bloggers too. It’s really about understanding your audience and maintaining a relationship with them. This can have such a massive impact on retention and increasing traffic. This is especially the case when it comes to social media and having people support you and share your content. Thanks for all the advice! The above is an absolute topic that I am looking for. Relationship marketing is really important strategies to grow sustainable business, and running long term earning. I think that it make more time for building relationship our customer, but when we’re able to get it done, the relationship will give us high performance of business. I am going to share you about an embarrassing of minds that I think is would an example of RM. The story started on last Auguest, last year while I went outside for buying Cigarette, sure I’m smoking man. You know..? the shop near by my house closed, so that I need to go a bit far from there. When I went to another shop, and buy a Cigarette, it was an embarrassing – I forgot my wallet at home. I gave the Cigarette to the shopkeeper, and told her that I forgot my wallet. I’m so sorry, I said. You know, what that seller told me that time..? She said, it’s okay..! You just kept that Cigarette, and pay next time. Honestly, I never knew that seller before, but she trust on me. I got private relationship with that seller, so whenever I want to buy something I always went to that shop even it is a bit far from my house. Sure, it is the important for relationship..! Anyway, for sharing your trick tips about relationship marketing, and strategies..! I really love you said in this post..! No you are not late ma’am, you just arrived at the right time. Yep, I agree full time with you. Building relationships prior to sales makes us a little less selfish and it brings us closer to our customers or prospects. Couldn’t agree more with the word of mouth. It is the best testimonial one can have. And yes having a good relationship always benefits and brings the seller and the prospect closer. Its more like taking sales as a secondary approach while holding the human relationships primarily. So your dad was a salesman. Whats a great job, you meet new people connect to them and sell them your ideas. So wonderful. Its not that salesmen don’t get a commission for what they do but there is no business which is non profit. Being a salesman you get to experiment real relationship marketing in the real world. Its commendable to sell people things. Some of my friends are salesmen and they speak high of the job. Wonderful post! I liked the all the positive points and particularly the line “When customer is GOD for businesses, relationship marketing is worshiping the GOD to get blessings.” I feel like tweeting it right then. Particularly, I would like to talk about the cons you mentioned in it. Time factor should be taken seriously. Otherwise, as you said, overtime could kill the growth. When it is about catching new prospects, it is the time to grow the size of the organization. I think that can solve the problem. WOM,. Yeah, I agree with you that a little fragment can cause a huge reputation loss. This cannot be recovered under damage control unless the company executes the ‘brutally honest yet safely’ strategy just like the one Steve Jobs implemented to nourish his dying ‘Apple’. Can’t wait to read the other posts in this series. Thanks for sharing such wonderful ideas. I am not surprised that thus post is going viral and it is an excellent post and very resourceful. I have heard of this term but knowing its history and benefit is a plus. Yes those who work towards building relationship with customers will benefit in the long but like you so mention, there has to be a balance. Thanks for sharing. Looking forward to more of the series. Hello Swadhin Bro, Thanks for your guideline. Really Great post indeed. Yes, This really works . When i started my blogging journey only one month ago, i don’t know any Blogger. So, i don’t get any benefit from social media as well specially Facebook. But, now i am connecting with many bloggers and that’s why i always get some shares, likes and so many on my each single post as well my Blog niche is Blogging. It’s quite an interesting post. I too believe that it is the relationship or networking that brings you the visitors and traffic. Otherwise if you are looking for organic or search engine traffic, you need to put up lots of efforts. Building relationships following the right relationship marketing technqiues with other bloggers, or through social sites can bring the traffic quickly and easily which ultimately leads to more business and leads. you are cent per cent right. With right relationships we can build huge customer/reader base which can be turned to generate leads later. Coming to the post, those were lots of links shared to wonderful sites, and while I don’t know much about the marketing aspect of it all, I do know about relationships! So, once the trust develops, the relationships develop too, whether you are in any business or just blogging. Knowing your customers, offering them incentive and any help they need, interacting and relating to them are all essential part of it all. True indeed, customers in our country are almost god-like and we respect them a lot – just as you aptly mentioned. So everyone should build those relationships and enjoy the fruits thereafter. Hello maam, thank you for appreciating my work. Yes it can be converted to an ebook too, I did not think it this way though. Thanks for the idea. Yes RM is a science and whatever I do I can’t share it all in a single post, so I linked all unique articles that took my topic further on their web pages. This way the readers too would get hold of what needs to be read extra to understand the concept. 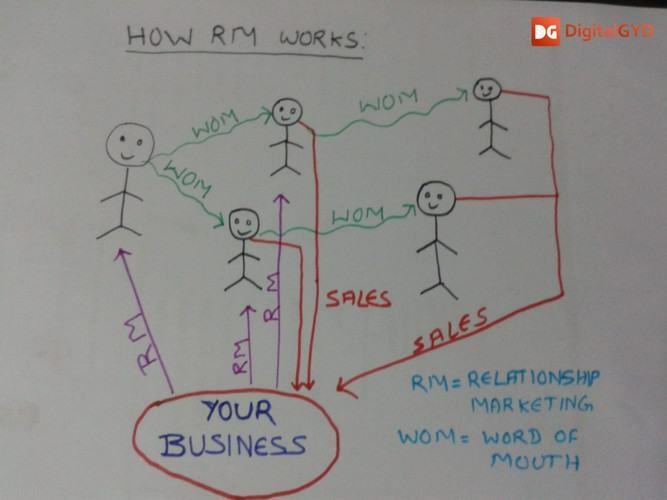 You are so right about that, RM helps you everywhere, whether you are a business or a blogger you need to maintain a rapport with your customers/readers so that they patron whatever you do. Who else can explain this better than you. You have a strong network of experts and novice bloggers. When customer is GOD for businesses, relationship marketing is worshiping the GOD to get blessings. Did you draw the second image yourself? That is so cute and explains the concept so clearly. I love it! Oh yes, I have have been following Buffer and the way they manage their blog and provide guides is truly commendable. Through relationship marketing you spend less on advertising is an obvious advantage. One needs to be aware of the disadvantages too. ;) Wow is this a series post? I look forward to read the upcoming posts. You are surely gonna make me sharper with relationship marketing. Hi Rohan, thanks a lot for those awesome kind words. Yes relationship marketing was there even before you (and I :P) were born. That quote, it came up from the basics, being from a business background I know how important customers are for us. Yeah I drew that image! You like it? I just drew that caricature because I thought I needed one to explain the concept. Thanks for liking it.